Check out how many calories in Plain Grilled Chicken Breast. Get answers to all your nutrition facts questions at FitClick. Description: Skinless chicken breasts seasoned and grilled. Tip: For nutritional information on all the ingredients in Plain Grilled Chicken Breast just click on each ingredient name. Then adjust the serving size for any Plain Grilled Chicken Breast ingredient with the serving size tool in the nutrition facts area to the right to see how you can save calories, carbs and more. Clean and trim chicken. Salt and pepper to taste. Grill chicken on hot grill for 6 minutes per side. 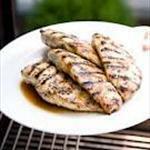 Find more recipes like Plain Grilled Chicken Breast. FitClick has over 60,000 foods and recipes with detailed nutrition information to view. I eat a lot of Chicken Breast, and I grill most of them, if not I bake them. I like them a little more spicy, I put Salt, Black Pepper, Onion powder, Garlic Powder and ground Cayenne Red Pepper. I add all my seasonings and let them set while I fire up the grill, and I put them on the grill and cook until the internal Temperature reaches 165, then I remove them from the grill to a plate, and cover with foil and let them rest for about 10 to 15 minutes and then serve them. they are so juicy, and cooked perfectly every time.